Blue Origin has developed a reputation over the years as a notoriously secretive company, only grudgingly releasing information about the company and its plans. While other companies hold high-profile events for media and customers (hi, Virgin Galactic!) or issue press releases about their ongoing efforts, Blue Origin only rarely issues releases or discloses information, which means those interested in the company hang on, and often try to parse, any words said by company leadership, including founder Jeff Bezos. On Friday, Bezos did discuss Blue Origin in an on-stage interview Friday that was part of the grand opening of the Bezos Center of Innovation at Seattle’s Museum of History and Industry. As reported by Seattle technology publication GeekWire, Bezos said that the company was now up to 300 employees, the first time in recent memory the company has disclosed a headcount. That makes it small compared to SpaceX, which now has over 3,000 employees, but likely on a par with the Virgin Galactic/The Spaceship Company team developing SpaceShipTwo, and much larger than other suborbital companies like XCOR Aerospace and Masten Space Systems. “The project is going extremely well,” Bezos said of the company’s efforts to develop suborbital and orbital reusable spacecraft, according to the GeekWire report. He said the company is working on its third iteration of its New Shepard suborbital vehicle, adding that he hopes this is the final iteration before beginning commercial service, although he didn’t offer a timetable for that. Blue Origin has also been working on an orbital vehicle concept that would launch initially on top of an existing rocket like an Atlas V, but eventually on the company’s own reusable boosters. The company got some funding and technical support from NASA under the Commercial Crew Development (CCDev) program, and although Blue Origin elected not to continue under the next funded phase of the program, Commercial Crew Integrated Capability, it has extended the Space Act Agreement it had under its CCDev-2 award to permit additional, unfunded cooperation with NASA. Bezos said that the company’s orbital vehicle would be ready for flights in 2018, according to the GeekWire report, but didn’t mention how it would be paid for given the lack of NASA funding. Those orbital flights, though, would likely come well after the suborbital vehicle begins service. “We will be able to have tens, if not low hundreds of flights [suborbitally] to prove out that flight heritage before putting people in orbit,” Brett Alexander, director of business development and strategy, said at a conference on human spaceflight organized by the US Naval Institute and held at the Naval Academy in Annapolis, Maryland, earlier this month. Blue Origin, of course, has also been locked in a controversy with SpaceX over their competing bids to lease Kennedy Space Center’s Launch Complex 39A; Blue Origin has proposed a multi-user commercial facility on the former shuttle launch pad while SpaceX originally sought an exclusive use agreement. SpaceX’s Elon Musk was openly skeptical of Blue Origin’s ability to use the launch pad any time in the next five years, telling Space News that “we are more likely to discover unicorns dancing in the flame duct” of the pad than Blue Origin showing up with an orbital spacecraft to launch in the next five years. However, Blue Origin has famously also taken the long view, not surprising for a company with the motto “Gradatim Ferociter” (roughly translated as “step by step, with ferocity”). Other than the $25.7 million it received from NASA, Alexander said the rest of the company’s funding has come from Bezos, accounting for “well more than 90 percent” of the company’s total investment so far (suggesting a total investment of well more than $250 million), and that this would continue for the foreseeable future. I really do hope Blue Origin succeed, true they are secretive but then again their work is like SpaceX so cutting edge. 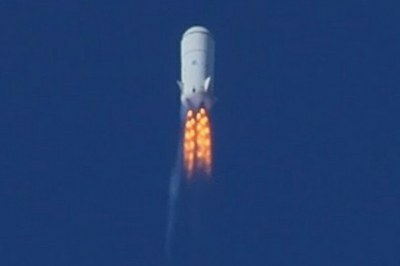 Please keep up the good work Blue Origin… whatever your doing. Oh yes, I love the company motto as well… “Gradatim Ferociter” (“step by step, with ferocity”).